Hello guys! Sky Watch Friday is here again. It’s the time to view and have fun while viewing the most wonderful skies around the world. My contribution for this week is a simple photo from Centreville Amusement Park Toronto Islands. 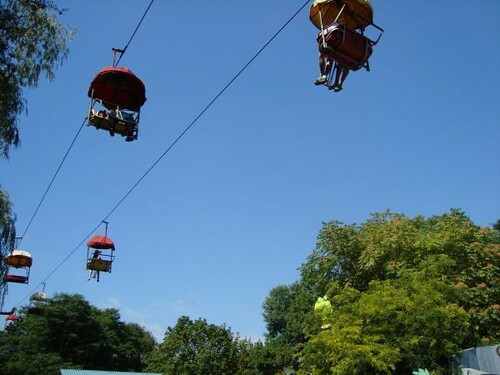 One of the fabulous rides and attractions is the sky rides for children. While the children were so excited and had fun with the rides, my friend Elma shared about the job descriptions she found in the internet. She got interested about it and advised me to check the website at hr.blr.com. To all my friends who love to join Sky Watch Friday, feel free to participate and don't forget to visit the site, leave a comment and put your URL in the auto link. Thank you for the visit and goodnight to everyone!!! that's pretty, but i like my feet on the ground! That's a nice way to watch the sky! Lovely chairlift shot! Winging high in the sky without wings! A very creative image for the them. I am somewhat afraid of heights, but how I wish I can ride this one, too! My SWF are posted here and here. Hope you can drop by if you have the time. Happy weekends! We rode those at Busch Gardens this summer. I don't like heights, so there are few photos from up there looking down. An interesting and fun photo! Lovely SkyWatch contribution.